Update: An Atlas of Enquiry can be ordered here at £5 plus post and packing. A limited signed and numbered box edition of 200 containing a set of Tapestry Cards, a Social Tapestries StoryCube and the Atlas of Enquiry. 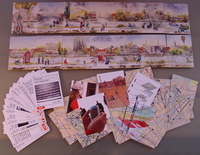 The 63 Tapestry Cards (3 sets of 21) make up a tactile embodiment of the myriad stories, fragments and processes of Urban Tapestries. At the heart of these are a Myriorama or, Endless Landscape, of 21 paintings. This is a device for storytelling that can be used by individuals or groups, each card extending, embellishing or forking a narrative flow. The 21 cards depict fragments of a panorama that can be arranged in thousands of combinations yet still create a continuous landscape. The reverse of the 63 Tapestry Cards fit together to form a map of London overlaid with pockets and threads from Urban Tapestries. The StoryCube creates a shift in the perception of scale, making tangible and tactile the abstract and complex concepts of public authoring into something that you can hold in the palm of your hand. Its six faces visualise some of the key concepts of public authoring. We will be posting details on how to order the Case (£65 plus post & packing) in the next week or two.